Q: As I resintalled Windows Vista, I’ve formatted my system drive completely. After installation, I found that some important files in “My Documents” in system drive were lost. I am wondering if there is any way that can recover my files after formatted. A: Usually there are a lot of data recovery software can recover files after formatted. If you get your system drive partitioned, the data is still in your system drive, but the system just cannot recognize it. Note that reformatting a disk does not erase the data on the disk, only the data on the address tables. At this time, you may use data recovery software to recover formatted files. However, if you wrote some data on the formatted drive, you may not get the formatted files back. Because the newly added data may take the place of formatted data. It is called as “overwritten”. if the newly installed Windows system doesn’t overwritten on the sectors where your important files once locates, you can recover them all. If it does; or even just overwritten a little part of the sectors where your important files once locates, you may not get these files any more. Here we recommend you to use Derescue Data Recovery Master. This data recovery software can recover files after formatted on system drive. It allows you to check if these formatted files can be recovered or not before you order the full version of this data reovery software. The most important aspect, which different form other data recovery software, is that you can enter the register code after the search, then recover the formatted files directly (some data recovery software doesn’t support this, which means you need to search twice to get your formatted files back). 1. Click the "Formatted Recovery" button on the main window of Derescue Data Recovery Master. The first screen on the "Complete Recovery" tool will display a list of volumes found on the drives found in your system. You should choose the volume that was formatted and click "OK" to start searching on this volume. 2. 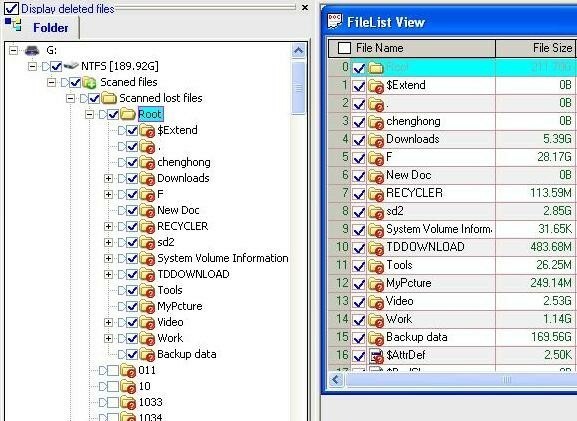 The Intelligent Searching will scan on the selected drive, collect and analyze every byte on the drive, then show you a list of folders which possible exist. 3. After this scanning is finished, Derescue Data Recovery Master displays a folder list on the left side on interface. Then you may choose where those important files were located. 4. Select the file or directory that you want to recover and right click, choose “Export “ files/folders. And save it onto your another drive. You will get your formatted files recovered. Note: if there are too many files exist in search result, you may use “Find” to search the specific files in search result.